Will my RT pannier liners fit the XR? Cause if they do, I'll keep them. But if they're going to be a duff fit, I'll get some new ones. It seems like there might be some differences in size and shape but I don't want to be budging them in there like National Lampoon on vacation. Anyone tried this? 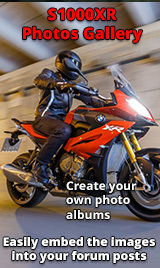 BMWs website lists the XR liners as the same as the 1200R only and distinct from the RT. But that might be limited to the new LC RT. Re: Will my RT pannier liners fit the XR? The RS and R are interchangeable. The XR and GTL each have different attachment points and are bike specific.